In radio right now: “And baby, it’s amazing I’m in this maze with you. I just can’t crack your code.” Don’t worry, Mr. Timberlake, I am here to crack the code for you. You just need to do what MC Hammer did: become a bit more geeky! Both of them seem to be confused: How did they end up in this horrific maze of fame? And they still don’t know why they love it so much, even when it is sometimes so painful. Fortunately, the right answers are out there. They have just been hiding in the laboratories of mischievous – and less famous – scientists. So what can they tell to Mr. Jay and Mr. Timber about sustainable happiness? Cause it might just come back on you ten-fold. As professor Eminem argues, we should be very careful about our dreams. The truth is out there: All goals are not created equal. The research shows that achieving some goals produces well-being, while achievement of other goals produces – well – ill-being. What are then the sources of sustainable happiness? What are the goals that produce true happiness? The key problem with too much fame is that while 2 & 4 might be satisfied, too much fame can completely trump 1 and 3. 1) Feeling Free: He can buy an island for his girlfriend as a birthday present, but at the same time: “can’t even take my daughter for a walk, see ‘em by the corner store.” He has certain freedoms others can just dream about, but at the same time he has been deprived of many freedoms that are self-evident for ordinary people: Being able to visit a corner-store, walk around freely on streets of Brooklyn – or any other neighborhood on this planet. 2) Feeling Competent: Hats off! Mr. Jay is ambitious, talented, and disciplined. He is the “post-millennial embodiment of the American Dream”, who won the game of making money out of hip hop. As regards competence, he is way up there! 3) Feeling Related: Having a sympathetic wife and a lovely daughter is great. But given that both he and his wife are quite dedicated to their careers, they might not have as much quality time together as your average Joneses. In addition, Mr. Jay complains how he is surrounded by pigeons. I am not an ornithologist, but Mr. Jay seems to have some knowledge about the behavior of pigeons: “But soon as all the money blows, all the pigeons take flight.” Finding friends when everybody around you is a pigeon? Not cool. 4) Contributing: A bit mixed really. Mr. Jay gives to charities, serves as a role model, and organizes cool things like Made in America festival. Harry Belafonte (the Banana Boat Song guy), however, criticizes him for turning his back on social responsibility. 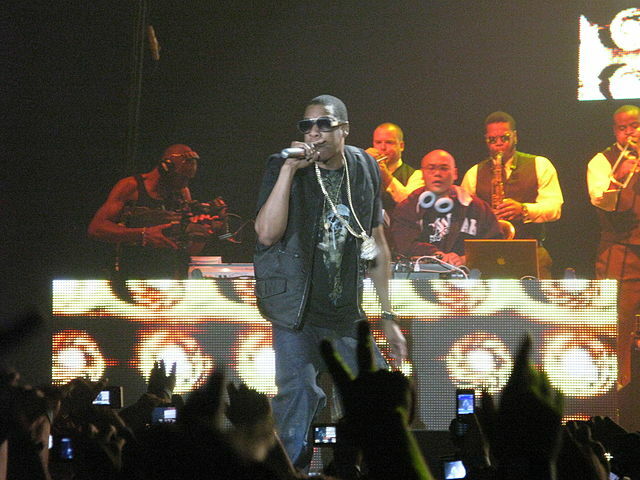 He thinks that Mr. Jay could do so much more with his high profile status and a net worth of 450 millions. In that sense, Mr. Belafonte feels that Bruce Springsteen is more black than Mr. Jay. Ok, now we know why Mr. Jay and Mr. Timber both love and hate fame at the same time. But where to go from here? What should they do to break loose and find that holy grail of sustainable happiness? Mr. Jay asks us to look at “what that s**t did to Hammer”. So let’s look at what happened to MC Hammer! For those born in the ’90s, MC Hammer was a guy who twenty years ago instructed us to not “Touch This”, leaving us wondering what exactly it is we can’t touch (and is it something we would like to touch in the first place?) He was huge in 1990! And surely, Mr. Hammer went through the usual cycle: huge fame, huge money, huge mansion in Fremont, California. And then the backlash: bankruptcy, loosing the mansion, out of fashion. But what does Mr. Hammer do now? It seems that he is living the good life with his wife and six kids while putting in some occasional missionary work for the local church. As for work, he is investing in and consulting tech companies, calling himself a “super-geek.” And he is right: he is definitely less cool when he talks about the user interfaces of search engines at Web 2.0 Summit than when he rapped about 2 Legit 2 Quit wearing Ray-Bans. In a nutshell, Mr. Hammer in 2013 is less cool, less famous, but more happy. 1) Feeling free: Less fame means more freedom to walk on the streets and have the benefits of normal life that superstars are deprived off. Still, he is so well off that he can do most of the things he likes, like traveling or having a nice house. 2) Feeling competent: He can still do it if he wants, for example mashing it up with PSY at the American Music Awards. And he is getting more competent in the geeky stuff as well. 3) Feeling related: Having been together with his wife for over 25 years, and having six children certainly is a good start in having satisfying close relationships in one’s life. Also in his work life he seems to be surrounded with fellow geeks he loves to hang out with. 4) Contributing: His work at the church as well as the way he helps tech startups both seem to give him a strong sense of being able to contribute towards the society and other people. That’s sustainable happiness, isn’t it! To get there, Mr. Hammer obviously needed to “Stop” before the new “Hammertime” started. He did that, found what is truly valuable in life, and is now living a more peaceful, less famous, but much happier life. So don’t worry Mr. Jay and Mr. Timber, there is also hope for you. Just become a geek – less cool, more happy!